Juniper Systems is proud to announce that the Mesa Rugged Notepad is being used as part of a community-based wildlife monitoring program, conducted by the Nunavut Wildlife Management Board, where native Inuit hunters are recording valuable wildlife population harvest data throughout the Canadian Arctic territory of Nunavut. We required the absolute best handheld device on the market. The Mesa’s brilliant screen was unprecedented when comparing it to other devices, as was the quality and durability of its unique design. Juniper Systems is proud to announce that the Mesa Rugged Notepad is being used as part of a community-based wildlife monitoring program, conducted by the Nunavut Wildlife Management Board, where native Inuit hunters are recording valuable wildlife population harvest data throughout the Canadian Arctic territory of Nunavut. Juniper Systems, along with international consulting firm IMG-Golder and Nova Scotia based Noreca Consulting, have been awarded a contract to assist with the design and implementation of this unique program, including a complete field data collection solution using rugged handheld computers, the development of mobile software, and a web-based database for uploading and accessing data. Three different remote communities in Nunavut are participating in this wildlife monitoring program: Cambridge Bay, Sanikiluaq, and Arviat. In each community, groups of Inuit harvesters are employed to collect wildlife data using the Juniper Systems Mesa Rugged Notepad running custom software developed by Noreca Consulting. While traveling on the land, the Mesa is used to log travel routes, mark GPS coordinates of wildlife catch and sightings, capture geo-tag photo images, and record a range of other species and environmental data. After the data is collected and the hunter returns to the community, the Mesa is immediately taken back to the office where the data is synced and uploaded to the main database (developed by Noreca Consulting) via the internet. Extensive product reviews and hands-on testing were conducted in order to select the best handheld device for this project. 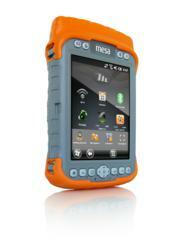 The Mesa Rugged Notepad was selected based on several criteria, including its large user-friendly touchscreen, integrated GPS, geo-tagging enabled digital camera (ability to embed and emboss photo with date, time, and GPS position), extremely low operating temperature at -30C, audio recording capability, and waterproof and shockproof design. After successful implementation of this community-based wildlife monitoring program at the end of 2012, researchers and policy makers will better understand the health of Arctic wildlife communities and harvest levels across Nunavut. Users accessing the project database via the web portal are able to access and view geospatially referenced data and images of some of the Earth’s most unique species such as polar bears, walruses, beluga whales, and caribou, as well as the traditional travel routes of Inuit hunters. Juniper Systems is proud to participate in such a unique approach to wildlife management leveraging the skills and experience of local Inuit communities. Juniper Systems is a world leader in designing and manufacturing rugged handheld computers for mobile data collection in extreme environments. Since 1993, Juniper Systems has provided innovative mobile technology to agriculture, natural resource, industry, geomatics, public works, and military markets.